Cotton Candy is the highest profit item in the concession line-up! 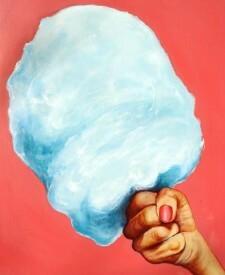 Everyone loves the great taste and vivid colors of cotton candy floss! Electrical Requirements: 110Volt, 15Amp Service. Extension Cords are NOT recommended. Rental machines do NOT come with a floss bubble or stabilizer!!! Click here for a Cotton Candy Tutorial Video! MOTOR: Makes the machine spin. HEAT CONTROL KNOB: Adjusts the temperature of the heating element. Setup your machine: it is easier to work "over" the machine. Place the machine at a height so that you may reach down into the metal pan. Plug in the machine and place metal "bowl" or pan over the spinner head. Add Flossugar: In the round opening on the top of the spinner (where you see the heating elements) Pour in flossugar, approx. 3 tablespoons or until sugar barely covers the bottom; machine should still be completely shut OFF at this point. TIP: Take a damp sponge or paper towel and run it along the inside of the metal pan to help the sugar stick to the sides. You only need to do this ONCE before you turn on the machine. Turn on the machine: Turn on the Motor (it is common for some sugar to spray out of the spinner at this time. BE CAREFUL and keep your face away from the top of the machine!) Turn on the heat switch and adjust the temperature (heat control knob should be just a little right of the half-way point.) You should begin to see cotton candy build-up in the metal pan within about 45 seconds. If not, adjust heat control knob. Harvesting the Cotton Candy: After a small "ring" of cotton candy has built up on the sides of your metal pan - reach into the metal bowl to the opposite side of where you are standing with either your hand or a floss cone. Pull the cotton candy toward you and out of the pan. Package Your Candy: If you're serving on a paper cone, twist the cone into the cotton candy and pull the circle of floss onto the cone. If you are using bags, gently stuff the candy into a plastic bag. Typically two reams (layers of the pan) is considered a serving. Clean Up: When finished, rinse the metal pan with water, the sugar will melt away effortlessly. Please DO NOT clean the floss machine; we’ll happily do that for you! Don't just make on serving at a time! The sight and smell SELLS! Display your cotton candy for an enticing visual and olfactory delight! After several cones/bags of candy you will run out of sugar, simply add more to keep your candy coming. This is also a great time to switch colors! Making Cotton Candy IS a skill! Practice, practice, practice! There’s no way to prevent some flyaway, don’t worry that some candy escapes the area of the machine. Always pick a color of floss that looks good on you, you’ll probably have plenty in your hair by the time you finish a hundred cones! Especially if it’s your first time, have a helper bag the cotton candy while you spin. Our bags are on a cardboard header designed to be hung on 2 nails or taped to a table. After the bag is full, just rip the bag from the header and twist tie, capturing air in the bag. Floss starts to shrink the minute you bag it. In the cool months, it will last from one to two days before disappearing, in the hot months, you may have less than 6 to 8 hours shelf life. Humidity affects the output and shelf life of your cotton candy, even though it’s not always possible, try to make the candy in an air conditioned environment. Be cautious of the spinner head, its rotating at a high rate of speed, keep your hands away!